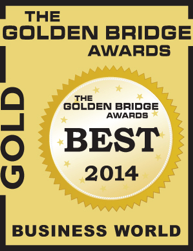 Voxox Named Gold Winner in Golden Bridge Awards for Outstanding Innovation! We are thrilled to announce that our Voxox app has been selected as a Gold Winner of the 2014 Golden Bridge Awards for outstanding innovation in consumer products and services in telecom, cable, broadband, and voice. The annual Golden Bridge Awards program recognizes and honors the world's best in organizational performance, products and services, innovations, and much more – from every major industry in the world. Voxox is no stranger to acknowledgements for its innovative technology and value proposition. The app was also recently recognized by the CTIA organization in the Emerging Technology Awards and prior to that we were named to the 2014 Fierce15 list with Voxox being a key consideration. While other OTT apps typically facilitate communication between users within the same app network and offer a limited subset of communication features, Voxox empowers people to communicate with whomever they want by whichever communication method they choose, all within one OTT app (replacing what would otherwise take multiple apps). New users receive free credit for their Voxox account, which will be topped up every month. This free monthly credit can be used to place outbound calls and send outbound SMS to anywhere in the world -- for example, 100 free calling minutes to phone numbers in the U.S. and Canada, or 52 free minutes to phone numbers in China, France, and United Kingdom. Voxox-to-Voxox communication is always free, as is all inbound communication to Voxox accounts from non-Voxox contacts. The Voxox application is available for iOS, Android, and desktop. To download the free app, please visit www.voxox.com/downloads.